A typical day for us usually involves sitting behind a desk staring at a computer in the basement of the BGS Edinburgh office. 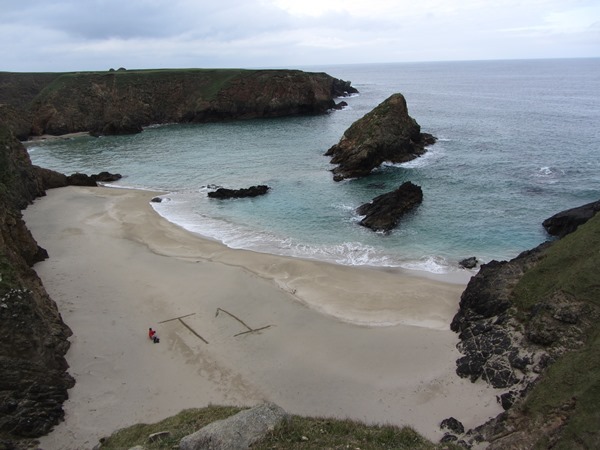 As marine geologists we are tasked with mapping the seabed and sub-seabed for government and commercial interests. 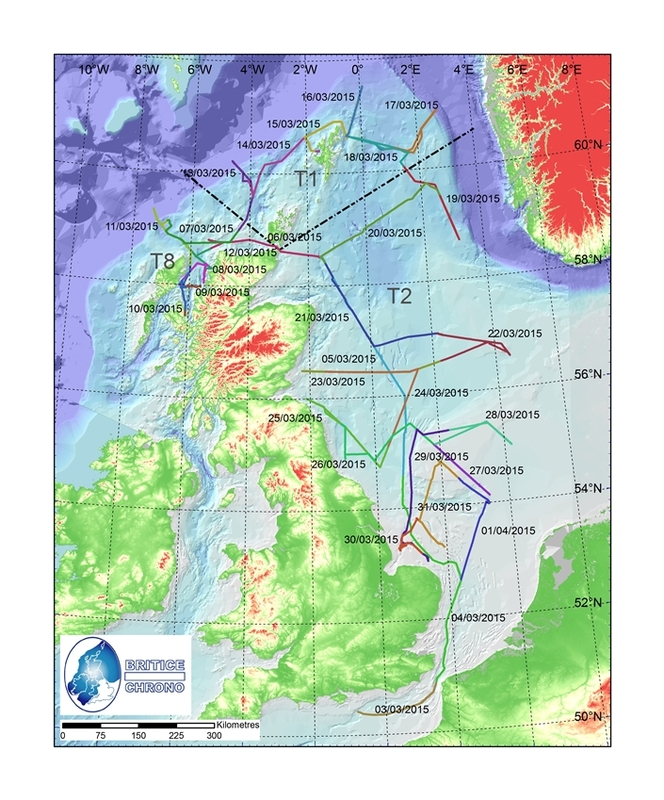 Fundamental to this is an understanding of how geological processes such as ice, rivers, wind, waves and tides have shaped the seabed over long periods of time. Our field area is inaccessible to us as it is drowned beneath sometimes thousands of metres of water and we rely on remote sensing data such as bathymetry and seismic to image the seafloor and make our interpretations. Once we have “guestimated” geological conditions we need to prove them with physical samples and this is where the BGS Marine Operations team comes in. 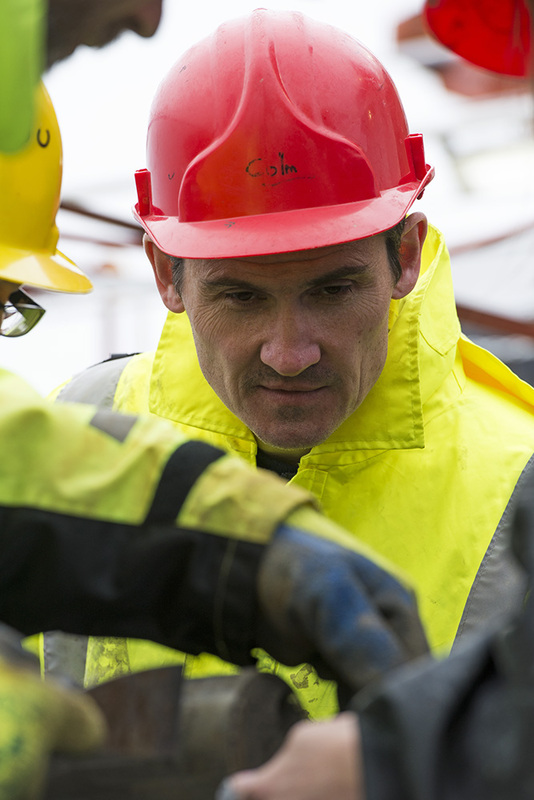 When carrying out our own research we focus on finding the most suitable site that will provide an answer to whatever question we are asking and we don’t spend too much time thinking about how the sample is recovered. Luckily we have a BGS Marine Operations team comprising electrical, mechanical and design engineers that can build and adapt equipment to meet our expectations. However, ignorance isn’t always bliss and by understanding how different rigs work and the logistics involved in transporting, fitting and fixing equipment on different vessels all around the world, we will have knowledge of how our data was collected and the limitations of its use. Claire: “I thought I would be fairly useless as a member of the operations team given that I am a typical “pen pusher” but I went in with an open mind willing to try anything. As the weeks have gone by I find it easier to lift the barrels meaning I must be getting stronger. I also seem to have started a scrap metal collection as I keep finding bolts and washers in all my pockets. This apparently proves your worth an engineer (according to Garry, one of the BGS engineers)”. After a while we decided to formalise our training so made ourselves engineer’s apprentices. As part of the apprenticeship we came up with list of skills that needed to be developed. These include tasks like winch operation (which is the most stressful part of the apprenticeship), vibrocore assembly, vessel awareness (Claire: “I can now distinguish the bulkhead from the deckhead”), health and safety and vibrocore driving. This last skill is obviously very important as when carrying out this task you get the comfiest seat in the container right next to the heater (which also reclines for when you’re on night shift). Additional skills every seafaring apprentice must have include coffee and tea making (including biscuit acquisition) to keep the team going on twelve hour shifts, rope skills (Jenny: “we can now both tie a rolling hitch with two half hitches to get the core liner out of the barrel”) and radio etiquette which varies greatly depending on accents. The final part of the training is tool recognition. We are getting good at this although there appears to be a nomenclature issue depending what tradesman you get e.g. a “toffee hammer” is apparently the same as a “quarter pound ball pein hammer”. 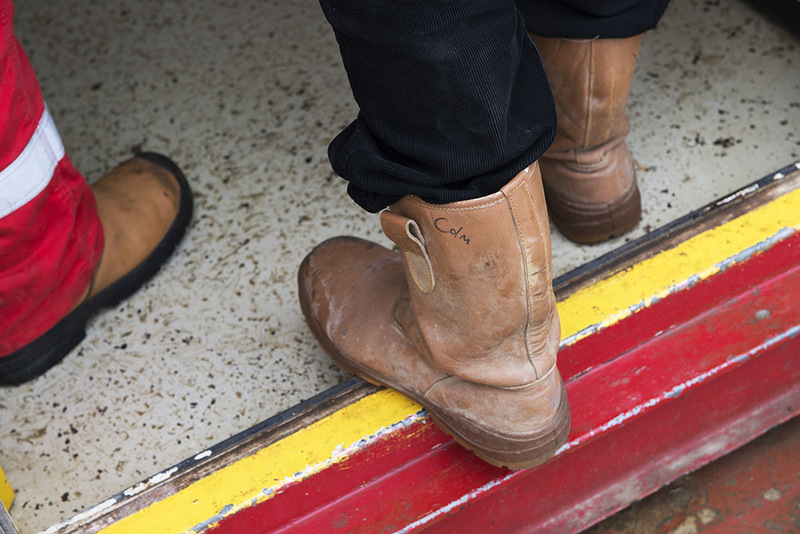 We do have it easy in comparison to the rest of the BGS engineering team as when things break down, which is likely to happen when you’re at sea for a long time, they surprise us by just fixing things. As engineers, this is their job, but it still gets us each time they make something work. For example, we are running low on core catchers as the geology keeps destroying them so we decided to just make some. A bit of improvisation and some welding and we have a new supply of core catchers, voilà! The work day for an engineer’s apprentice is so refreshing yet tiring. We are outside all day which is delightful when the sun (or moon) is reflecting off a reasonable calm sea with big white fluffy clouds on the horizon. Even when the rain is horizontal and the waves are crashing over the deck, we still look forward to getting out to work. 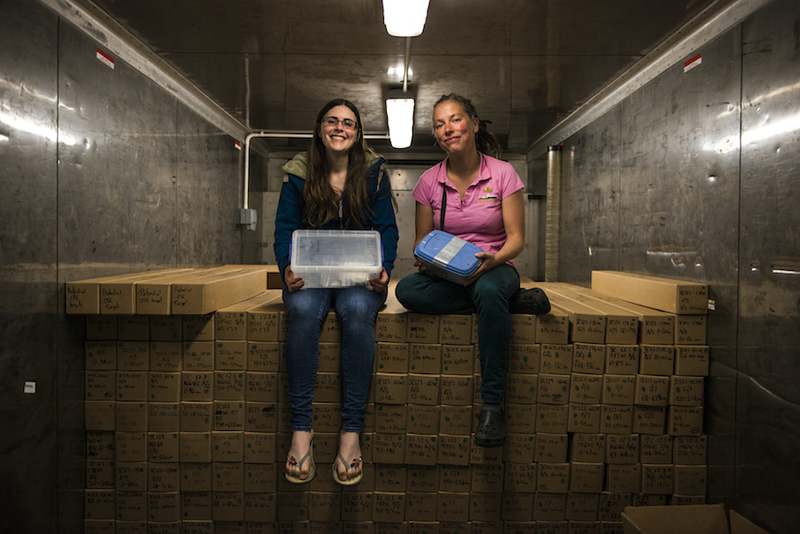 When compared to the often solitary life of a scientist where you exist in your ideas, it is a welcome change to be working outside as part of a team of engineers and ship’s crew physically collecting the scientific data you spend most our time working on. Claire: “I must add here that the ship’s crew on board are all extremely patient with helping us in our training (especially when it comes to winch operation!)”. 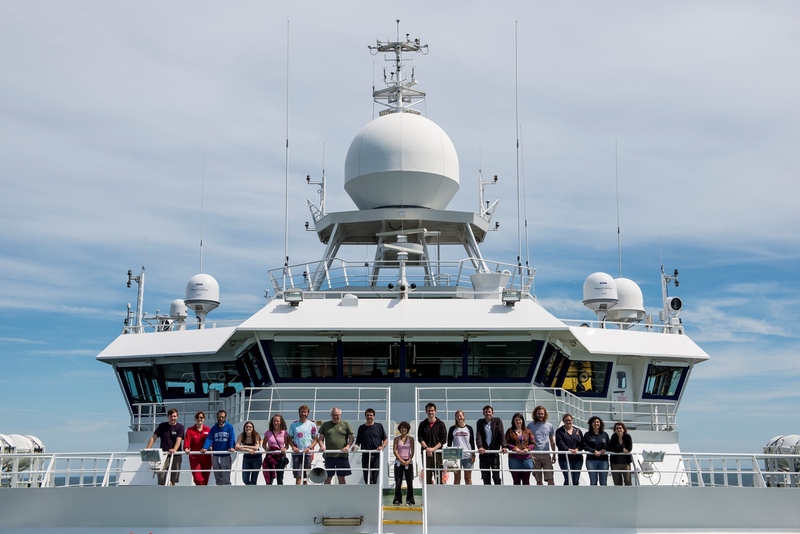 We keep being asked if we prefer being a scientist or part of the operations team on a research cruise and it’s a difficult question to answer. Claire: “It is a bit of a holiday for me being an engineer’s apprentice as it is not my profession, therefore all the pressure is on our trainers (Iain and Mike’s) shoulders. I do appear to spend a large part of the day laughing (usually at myself) which is a sign I am enjoying the work. However, if I had a 90 m research vessel at my disposal, as a scientist, I can only imagine the fun I would have!”. 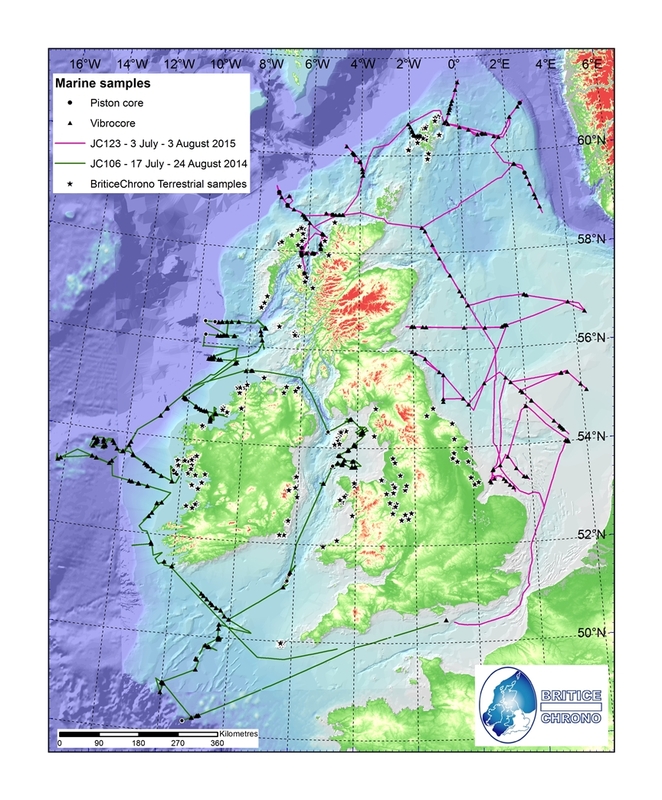 This entry was posted in General chat, Marine geology specific issues, Publicity activities / knowledge exchange / media coverage and tagged BGS, briticechrono, British Geological Survey, Cruise, Marine, marine sampling, RRS James Cook on August 20, 2014 by briticechrono. 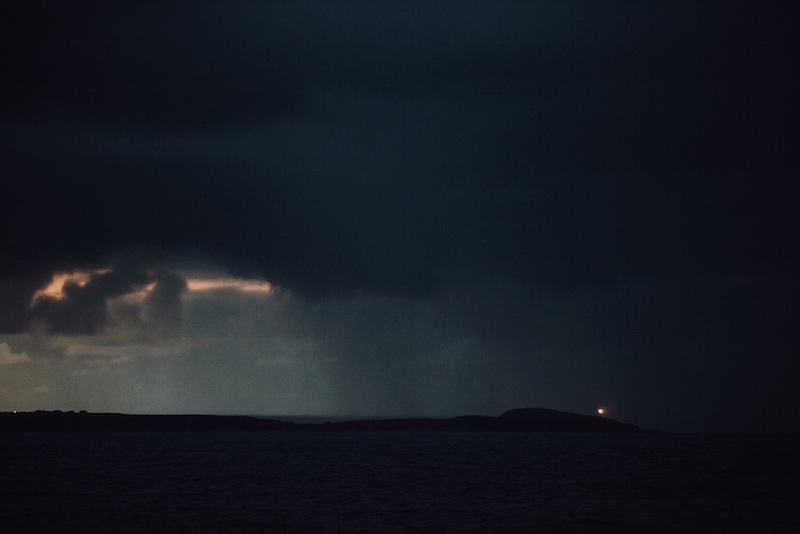 It is Saturday August 16.We have just completed a mammoth vibrocoring transect on the northern Porcupine Bank and are heading east across the shelf in choppy seas and overcast skies towards County Clare, Ireland. We have about 7 days of science left now and I occasionally find myself starting to think that we might be near the end. This is ‘dangerous’ thinking though – best not to count your chickens etc! 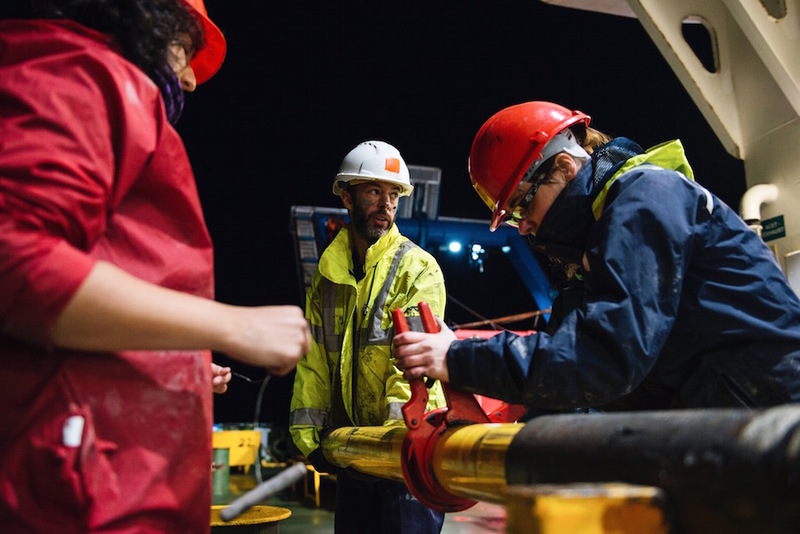 There is still a lot of science to be done, seafloor to be surveyed, cores to be collected, handover meetings to be had, instructions to be written for the Bridge, the Deck Crew, the Science team and plans to be made, possibly unmade and then made again. Life as PSO (Principal Scientific Officer) on the ship is different for each cruise in that the science objectives, goals and methods obviously differ between different cruises but in my experience two things remain fundamental and constant to the job of a PSO whatever the cruise; they are communication and planning. On JC106 a big part of my day as PSO is about communication. We have a morning meeting with the Captain and key members of the Bridge, Engineering, Deck and Catering teams. At this meeting any issues that have arisen in the last 24 hours are discussed as well as the science plan for the next 24 hours, where we will survey, where we will core, how many cores we will take etc. At midday we have a handover meeting between the outgoing ‘night shift’ and the incoming ‘day shift’. Again this is all about summarising what we have done, our progress measured against the current plan and what we are going to do next in the short and medium term, as well as airing any problems that have arisen or general housekeeping matters like flagging up to the science party that there is going to be a fire drill or that the tail end of Hurricane Bertha is about to slam into the western Irish shelf and we will be changing the science plan…(thankfully that last one, although predicted, did not happen). At midnight you do the same thing again with the outgoing ‘day shift’ and incoming ‘night shift’ and in between you inform the crew what is happening or going to happen, talk to the bridge, talk to the BGS coring team, the NMFSS piston coring team, write up the plan on whiteboards around the ship, make numerous decisions about when to move on from a core site and when to core again, where to survey, when to cut a survey short, as well as generally trying to ensure that everyone who needs to know, does know what is going on! While everyone else on the science team is divided into two shifts of 12 hours (the day team and the night team) as PSO you straddle both shifts. So that means long days and you never really switch off mentally. In your head and with your plan you are always, at least ideally, a minimum of 24 hours ahead of real time, sometimes less, sometimes more. In fact you find yourself constantly living life in the future in your head on the ship. Even if you have one plan and the cruise is operating on that you usually have a second plan for when the present one ends or to act as a contingency in case things go awry and the plan needs to change. The one thing to avoid at all costs is to suddenly find yourself in a situation where present time and the end of your current plan actually coincide because then there is a pause in data collection! This is bad and when it happens it can make for a somewhat stressful time. It usually coincides with when ‘things go wrong’, usually due to problems with equipment or weather. Classically this also happens when you are in bed asleep. The phone goes, you fumble for the receiver in the dark and the voice at the other end tells you that there is a serious problem and you need to get up. There then follows a fairly ‘intense’ period while you think about various alternative plans, make a decision on what you consider to be the best one and then pass it on to the Bridge to execute. Trying to get back to sleep after that though is usually a non-starter….. So as a PSO ‘the plan’ is critical for the success of the cruise. If it is good people are happy, if it does not work out then you need to change it promptly and keep people motivated to achieve it. So far JC106 has been highly successful (I am touching wood with my left hand as I type this with my right…). We have collected great data and have had relatively little bad weather (again touching wood). The success has been due to the hard work of everyone on the ship: the science team for their never ending hard work, their good humour and motivation; the Bridge team and the Captain for their skilful manoeuvring of the ship onto core sites and overlapping swath tracks, the Deck team for their professionalism and ‘can-do’ attitude, BGS and NMFSS for their ability to recover great cores, fix whatever is broken and make core catchers from twisted pieces of metal, and finally, but oh so importantly, the catering team for keeping us all well fed. Only one more week to go now so I had better get back to planning…. 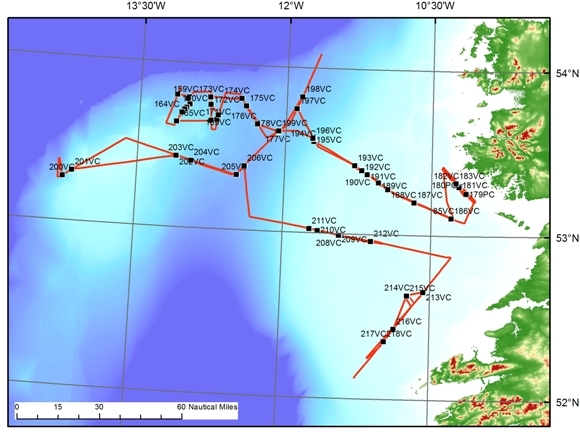 This entry was posted in Marine geology specific issues and tagged briticechrono, Cruise, Marine, marine sampling, RRS James Cook on August 18, 2014 by briticechrono.